That sounds good to me. I'd love a little leeway with the stats, but I feel there are some good RP reasons for that. What with dying and coming back to life, piece by piece. It would feel off, though, to have a character who had an 8 dexterity suddenly have 19. I also think there's great RP room for multi-classing, given the years between the games, and being an awakened watcher with access to the past lives of your soul. In BG the essential mechanics didn't change, did they? It was still AD&D 2nd edition in both? From my experience of PoE2 so far, I'd say it's more of a .5 or 1.0 step up in ruleset. If PoE1 is 1.0, then PoE2 is 1.5 or 2.0. 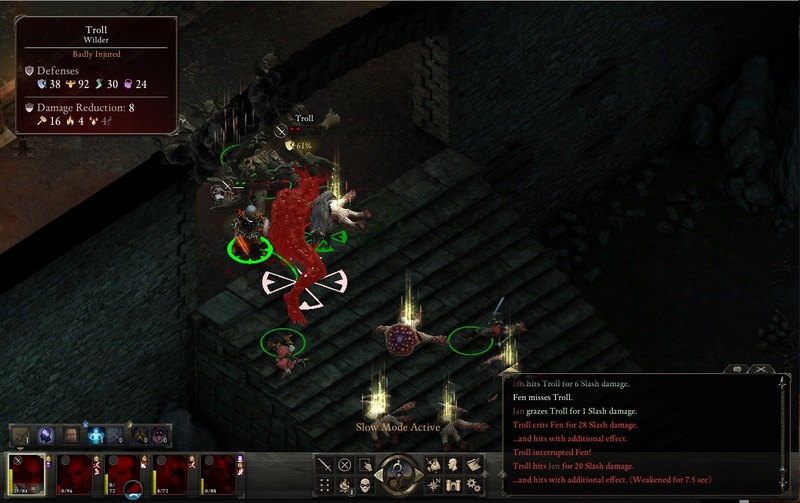 @Ivanfryodorovich: Most of us played BGTutu back in the day rather than the original Baldur's Gate (partly because modding BG1 wasn't really a thing), which meant we were playing BG with the BG2 engine. 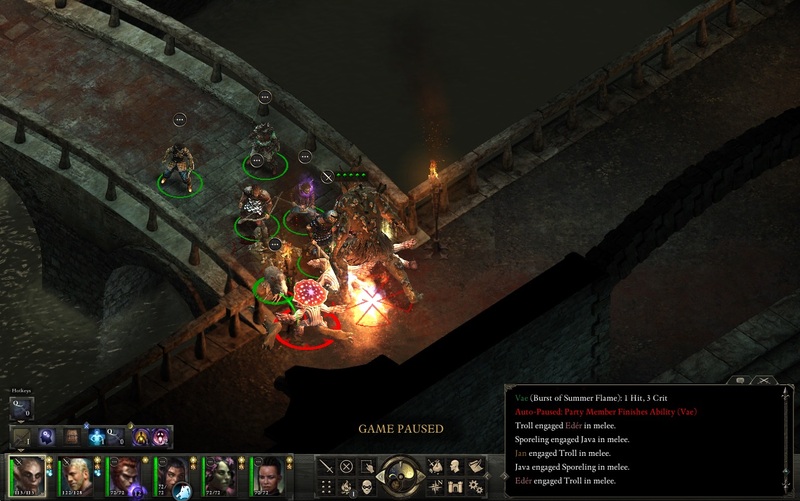 Thus, we had the option of choosing kits, and spells and items operated as they did in BG2. 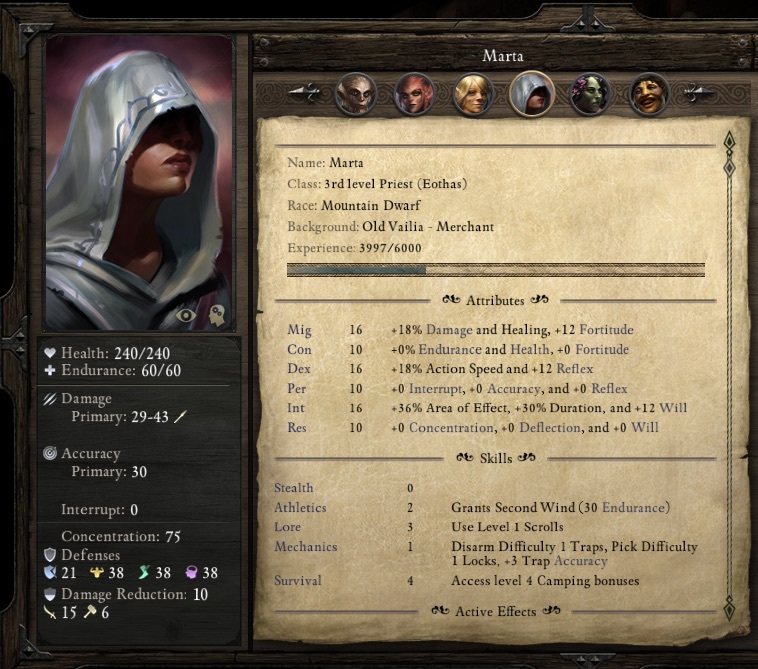 If I recall correctly, importing a vanilla BG character into BG2 allowed you to change their proficiencies (proficiencies were different in BG2) but not give them a kit. That is, your longsword-wielding fighter could become a katana-wielding fighter, but not a katana-wielding Kensai fighter. BGTutu and EE removed the differences for later players, so it's not an issue anymore. For RP purposes, almost any change in a character build would be justifiable due to the whole reincarnation thing. 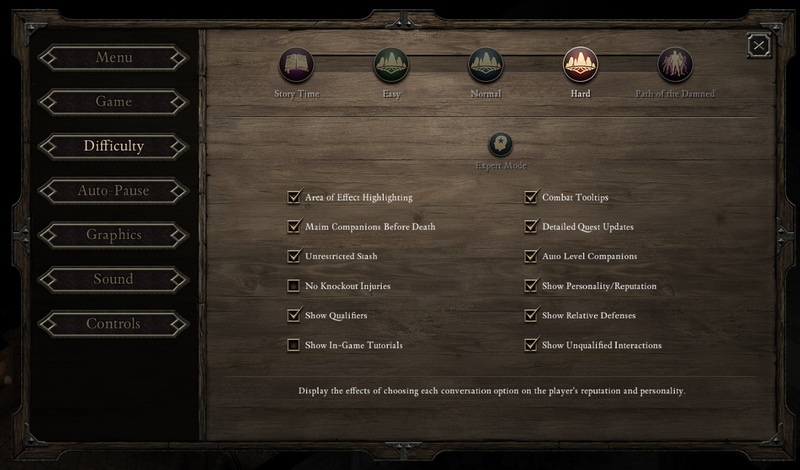 For the purposes of this challenge, I think the main reason to stick with the same basic class is so that we're facing both PoE and PoE2 with the same character, so the nature and intensity of the difficulty is consistent. Switching to a whole new class would allow the player to choose a more optimal build for each game, so I think we should avoid distinctly different character builds. A specialist kit or a multi-class would be fine, largely since we wouldn't want to ban fighter/thieves and such from the Hall of Heroes. But stats are a different story. Your character can operate pretty similarly even if you make some adjustments to stats, so I think we can afford some leeway. Maybe we could limit the stat difference to 2 or 3 or 4 points away, per stat, from the Watcher's stats in PoE1? That is helpful info and makes sense. I’m curious how y’all will find PoE compares from a ruleset/systems perspective. I agree that ability scores matter less for PoE, but also that there should be some continuity. It feels weird to have the stats be totally different. There’s a great talk on YouTube that Josh Sawyer did a few years ago about ability scores for PoE that is interesting if you’re into game design. They intentionally designed the system to make choices feel impactful but with a much smaller range of outcomes - I.e. no bad builds and no god or dump stats. Results are mixed, but it sounds worlds away from BG based on the talk. I think we should give as much room here as we can in terms of freedom to change them, but still make it feel like it’s the same character. A 4 point difference feels fine to me. 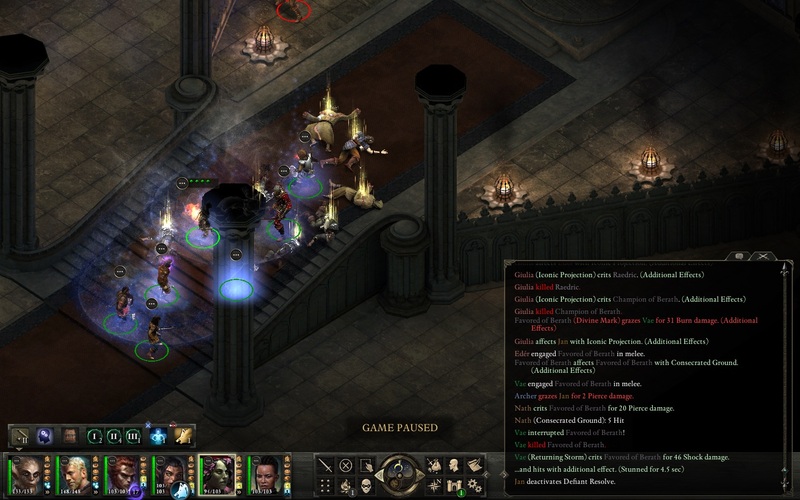 Personally, I don't like to respec a character during the run and actually never do that in any game which allow that (Divinity: Original Sin comes to mind). This seems pretty weird to me RP wise. 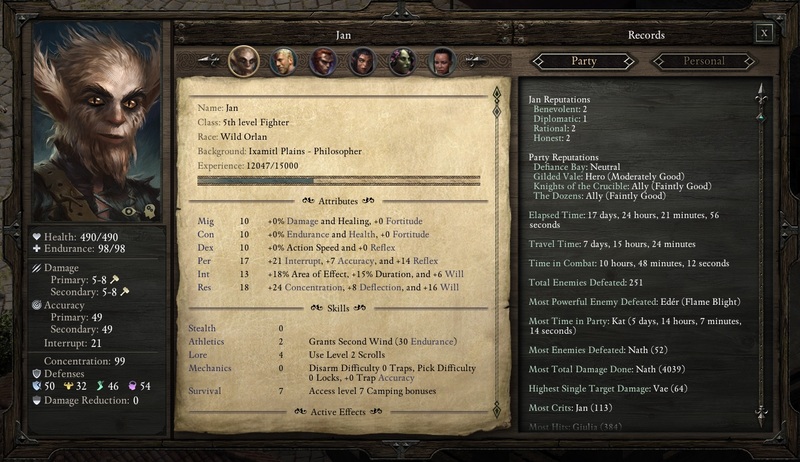 And since I want the very same character to do the full saga run my PoE2 char will be the same stats wise with some class diversity allowed (i.e. making him multiclassed). This is just my personal approach and I don't mind others might see it differently. This is still going on . Happy New Year, guys. Best ahead. Character update for my Fighter. Now level 8 and going strong, most Defiance Bay quests are done, about to start Heritage Hill. Stats and abilities are strong across the board. 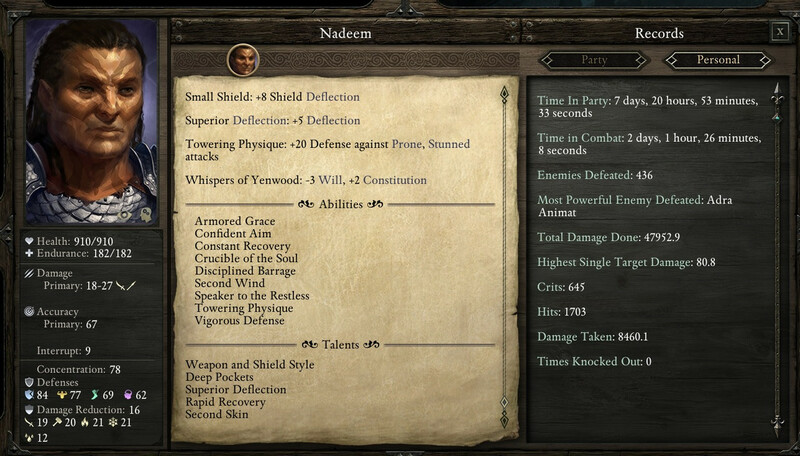 I took Superior Deflection at level 6, Armoured Grace at 7 and Rapid Recovery at 8. Sided with the knights so have recently acquired Second Skin. You can see crit rate has remained around 25% but is now edging upwards as my ACC improves (currently 27%). Damage ratio has also improved and is now around 6x. I upgraded sword, shield and armour to exceptional at level 8. Notable find was Gauntlets of Accuracy, remaining equipment is fairly standard. Still making extensive use of scrolls and potions (I wish there was a tracker for how may items you use, I'm probably setting some kind of record in this run). Combat strategy often goes something like Vigorous Defence -> defensive potion (Spirit Shield/Mirrored Image) -> Disciplined Barrage -> Nature's Mark (debuffs DEF and REF) -> Fan of Flames/Burst of Summer Flame (often 2 or 3) and then mop up the rest with sword. I'm literally spending around 5k copper per day just buying crafting components from Lora/Coren/Cartugo/Curnd. 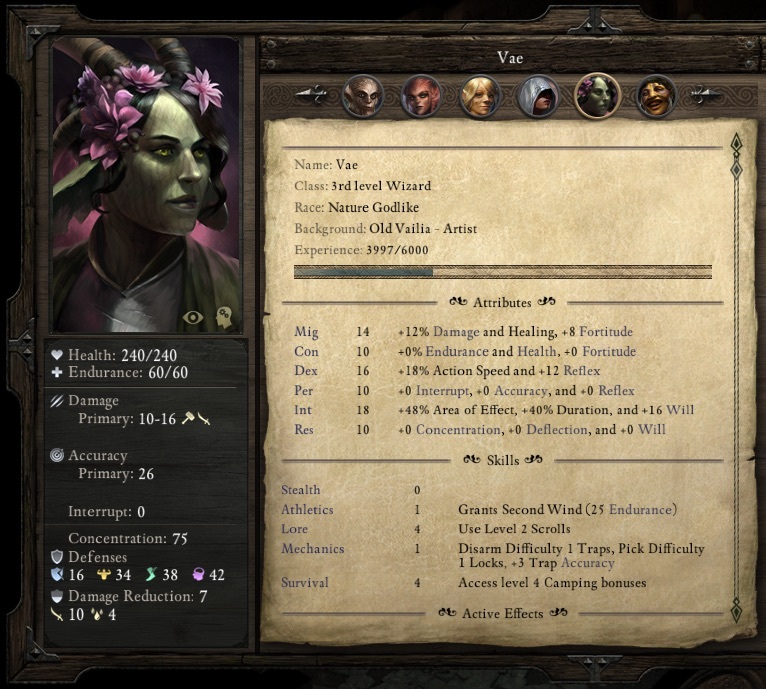 Also discovered to my disappointment that Vigorous Defence does not stack with Scroll of Defence (I thought they might since one is ability and one is item, but I guess they both count as activated abilities). Edited by Jaheiras Witness, 10 January 2019 - 02:58 PM. Hey all No-Reloaders. What's the temperature like for moving over to PoE2? It's been quiet here. Hope all of you are well! 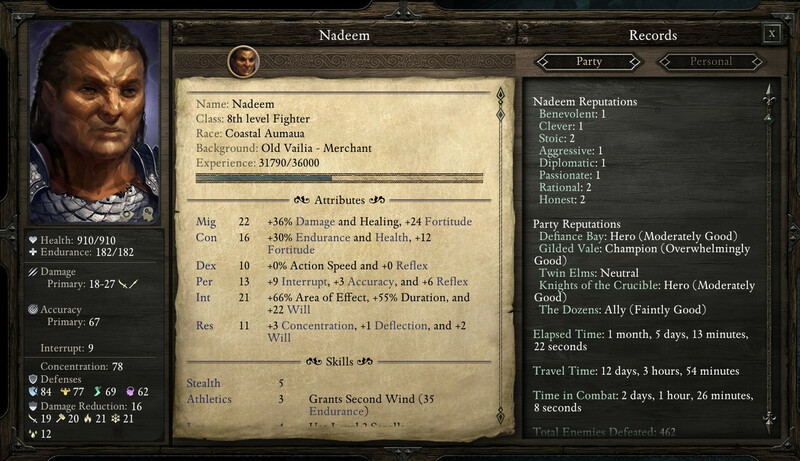 I'm still going with both of my characters, though quite slow (finished all Act II quests and intend to move into WM now for Gloomy Face and made some progress with Grim Face, though have him rerolled and restarted since I wasn't happy with his average perception (10) and thus accuracy). But since it's indeed a deep slumber over here lately and I wasn't sure anybody will read anything I've postponed my posting until I'll make more significant progress. Edited by Serg BlackStrider, 29 January 2019 - 01:15 AM. I've made no progress in my run (I've been doing an unrelated BG run), but as soon as the new thread is created, I think I'll get back to PoE2 and start posting. I don't have anything saved up, but I'm ready to go whenever. Great to hear from you Serg and Semiticgod. I just completed a PoE2 regular reload run and am playing around with the turn based mode with some new characters. 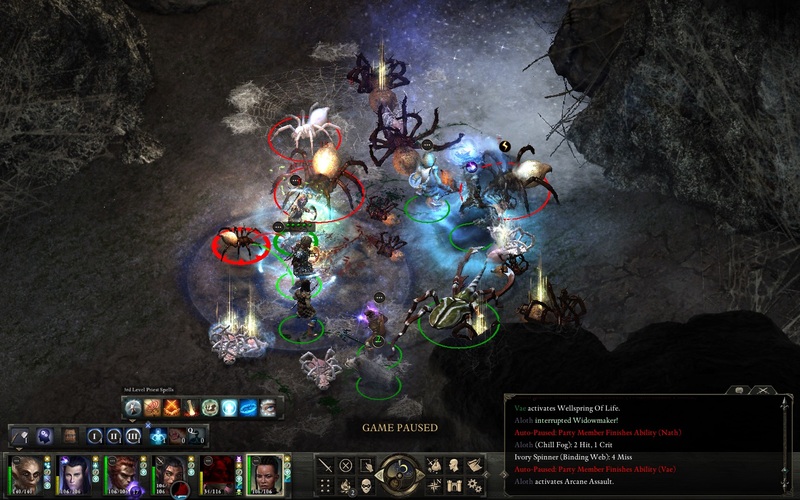 It's really more my style (Temple of Elemental Evil and Final Fantasy Tactics are top 5 games for me), and it really changes so much of the system (as if PoE2 needed more new things to consider). 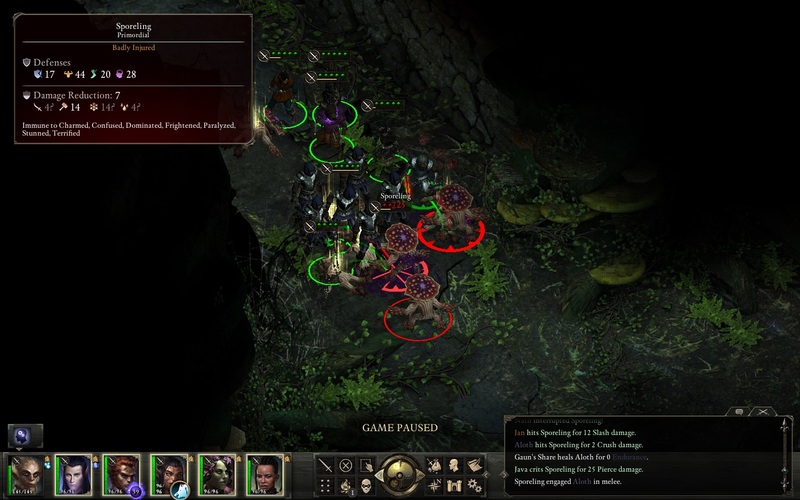 I'm also starting a new PoE1 NR run with a new group to take into PoE2. I'll get first post in here, but I intend to keep it light. I'll document some key fights and summarize my play experience for each Act. I'm trying it with a slightly more vanilla set up - no DLCs and trying to move through the core quest more quickly. I'm ready to start a PoE2 NR run whenever we are ready. This run is meant to create more space for me in PoE2, with another main character to play with. Now that I have a sense of PoE2, this character is built for transitioning into that world and system a little bit more thoughtfully than my last. This group will be primarily 4 custom characters, with the last space sometimes occupied by a companion and sometimes empty. I plan to complete some of the companion quests, but not all. Jan is a philosopher from Ixamitl Plains, where he studied for many years, but grew tired of abstract ideas without connection to real embodied and lived experience. His training with arms was that of an armored foot soldier, and though inexperienced with combat, his skills have potential. He needed to spend less time in his head, and so, set out for something new. The call to come settle in the Dyrwood came at just the right time. Update: Trolls are no joke at level 4, even on Hard. The party has died. I feel good about the experience, though. I was cruising through at max speed, without much care for the risks, and I've learned the limits of that approach. I will probably recreate a similar team, but think harder on my path through act 2. I always fight that lot on the bridge just outside the chamber. Lure them up and only a max of 2 can engage you on the bridge while the rest are packed behind them (perfect AoE fest). Still level 4 is very low level for that area. You must have whizzed through Act 1 and gone into the catacombs as one of your first tasks in Defiance Bay. Bingo. They were jammed up real well on the stairs at the start, but once the sporelings died I did not maintain the front line and once one troll got in the back my low level custom characters were short lived. I want to play it as a (mostly blind) ironman POTD solo run. 2 endurance, 17 endurance and 8 endurance. Edited by Reent, 02 February 2019 - 01:36 PM. Making another go of it for Jan. The core party will be 4 custom characters: Cipher, Ranger, Priest, Druid. I'm also rotating a spot for Eder and Aloth. Sir Dies Alot 8 is going strong! Lvl 9 just now. Edited by Reent, 17 February 2019 - 06:31 AM. Act I was smooth sailing. I picked up the custom adventurers right away and moved through all the available quests in Gilded Vale. We brought along Eder for all of them. Having a druid has been a fun change of pace. Picking up the utility talents like Scion of Flame and Heart of the Storm feel immediately useful. No photos taken during Act I. I entered Defiance Bay with everyone level 4. We will hold off on Raedric until we gain another level for the team. Better safe than sorry, even on Hard. Act II we try a little bit more streamlined approach. I skip some quests in Ondra's Gift, as well as a few odds around town. We snag some of the easy ones first to level up to 5 for everyone, including starting the crucible knight quests. At level 5 we take a pause and go back to depose Raedric and snag a cash infusion. We jump back on Act II quests, heading to the catacombs fully rested and ready. We talk with the Records Keeper for Eder, making good use of our high resolve MC. We get the battlefield part of his quest out of the way, and swap him out for Aloth for most of the rest of Act II. We give him some heavier armor and a shield with lots of buff spells and he makes good use of the summoned staff. Hardened Veil keeps him happy in the middle of lots of enemies. We clear out Heritage Hill and the Sanitarium, completing his quest in the process. Out in Dyrford I try an experiment to see if a custom cipher can wipe Aelys during Blood Legacy. (the answer is no) We let her go. I'm not feeling quite cold enough to kill her right there. Somehow the idea of her murdering her abusive uncle seems fine to me. While in Dyrford, we settle some local issues, too. I manage to pull the whole spider cave at once and have a somewhat challenging fight that turns out to be quite fun. Our last work here is investigating Cliabin Rilag. For the first time in several playthroughs, I manage the spore room without triggering any traps. Having everyone equip a ranged weapon to take down the immobile spores works great. Huzzah! Before we wrap up Act II, we head to Caed Nua and clear the first 6 or 7 levels of the Endless Paths with Kana in tow. We complete his quest and fight the Leaden Key operatives on level 1. Back in Defiance Bay we tell the Duke that Animancy should continue - if Dyrwood doesn't, someone else will. 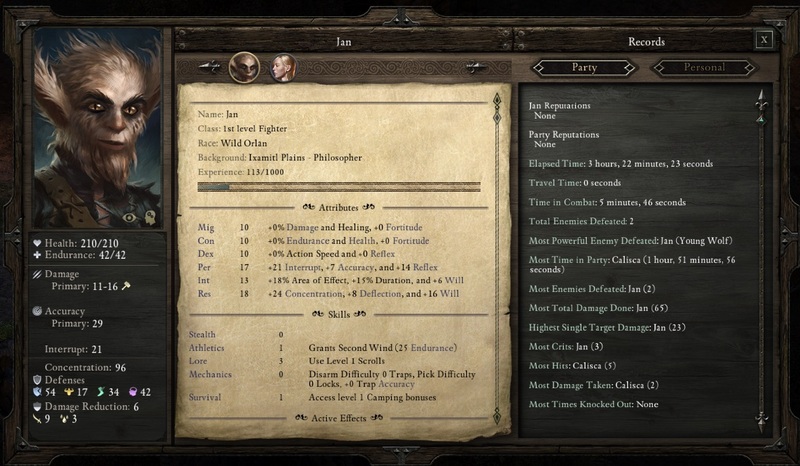 Our Wild Orlan Fighter Jan is maximizing DPS with a sword and shield. He's taken Weapon Focus and one other fighter talent to match, along with Weapon & Shield Style and Bear's Fortitude. Our Hearth Orlan Cipher Nath has Weapon Focus Noble and the Whip talents. He swaps between a rod/scepter and our best 1 handed Mace & Dagger. 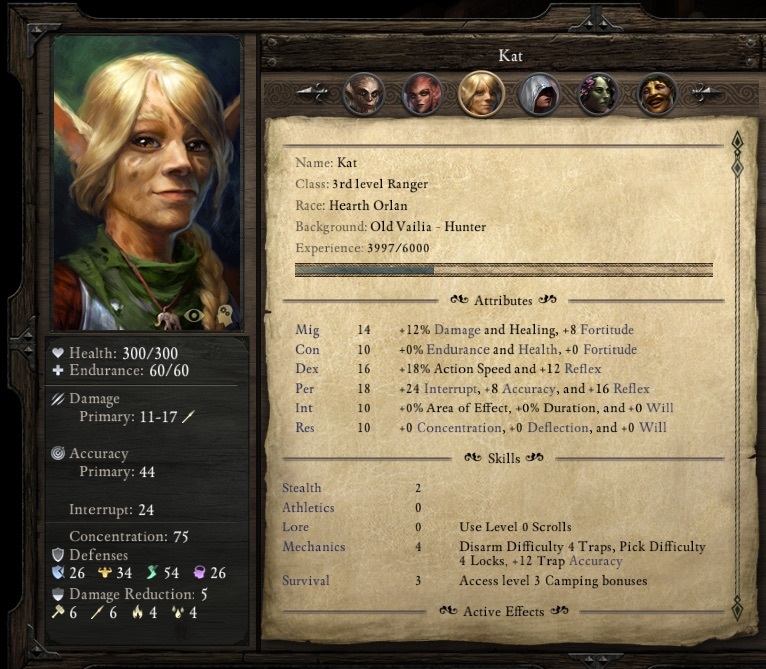 Our Hearth Orlan Ranger Kat has built her Boar Companion Java for maximum damage and resiliency. We also have taken Driving Flight. Persistance or Sagani's bow when we fight pierce immune enemies. She also has Weapon Focus. Our Nature Godlike Druid has Heart of the Storm and Scion of Flame, along with Bear's Fortitude and bonus 3rd level for more storms. So many fun spells to play around with. We took Sunbeam for our first mastered spell. 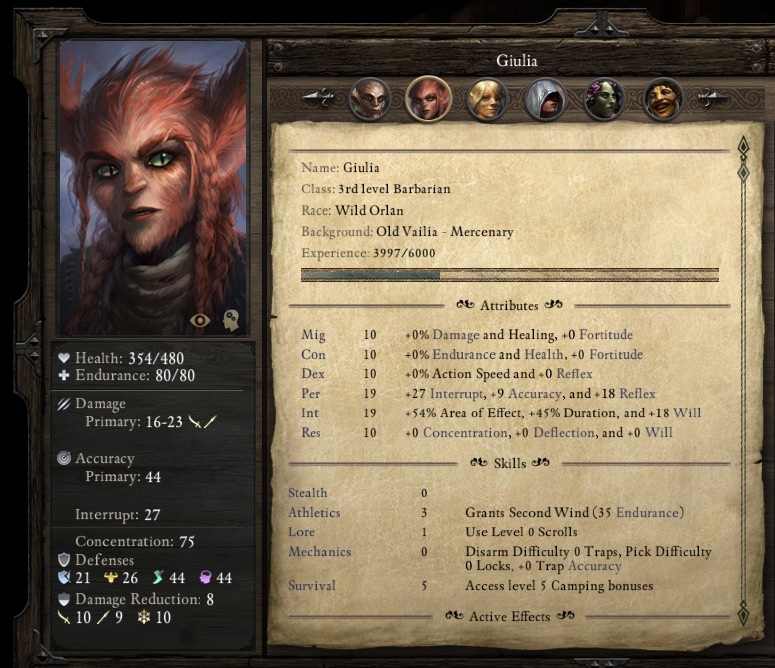 Lastly, our Mountain Dwarf Priest Giulia has built out Inspiring and Aggrandizing Radiance and Painful Interdiction. We took Armor of Faith for our first Mastered Spell. By the way, is @Harpagornis active here these days? He's one of the most brilliant and inventive no-reloaders I know, and it would be great if he was interested in this challenge. That's the guy who did the Noober run. Craziest thing ever. Tried potion of major recovery for a few fights just now, damn, thats one easy way to deal with everything (other than too much burst dmg and petrify, still thinking about those pesky adragans i have to face), i had a few close calls with Insect Plagues before, with the potion i can simply watch everything burn. Sir Dies A Lot is lvl 13 now, i did a few quests in WM1, but i fear the permaCC too much, so i will lvl as much as possible before going back - i don't want to play the summon game i did with my naked chanter. I thought they added a merchant at that spot (Anslog), i'd love some of the items - can someone tell me where i can find him? Bounties are fun for chanters! Edited by Reent, 02 March 2019 - 07:47 AM.